The water we should use is demineralized microbiologically pure water. This kind of water has a cost and it is usually sold on websites which sell cosmetic ingredients (you can find some links of online shops here). But why can’t you use tap water? Tap water is definitely not demineralized, so the minerals contained in it will interfere with the ingredients of your formulation, ruining all the recipe: the minerals in fact are electrolytes and will disturb every electrolyte-sensitive ingredient in the formula. On the market you can easily find demineralized water (used for ironing), BUT this water is not microbiologically pure. If water doesn’t contain minerals, bacteria can still grow in it! If you cannot buy demineralized microbiologically pure water (or if you cannot wait to get it 😀 and you immediately want to make your cream), you should at least boil the demineralized water. There is a method called “heat and hold” which consists in heating up the Phase A and Phase B (of a heated formulation, of course) for 20 minutes in order to both kill bacteria (of the phase A) and melt very well all the butters and waxes (of the phase B). You must have indeed noticed that I never give the right amount for water in my recipes. I always write “Water to 100”. The calculation of water is left in the end because it enables you to make some changes to the recipe. Changes are always useful or needed: you might not have the same ingredients I have (for example the preservative! You might use a preservative which needs to be added, in order to work properly, at a different percentage than mine! ), or you might miss some ingredients completely and therefore you need to omit them. I will never repeat this enough: it is very important to keep the percentage of use of our ingredients stable. In this case water will be calculated in this way: 100 – (1.5 + 0.5 + 3) (these being the amounts of the other ingredients: we are calculating how much grams are needed in order to reach 100%). So the amount of water needed in this recipe is 95 grams. However a reader might not have Xanthan Gum and might want to try using Hydroxyethyl Cellulose, which has a different way of gelling the water and needs to be used at higher percentage than xanthan gum (understand this is just an example). Let’s say the percentage of use is 3.5% HC; then the water will be calculated in this manner: 100 – (3.5 + 0.5 + 3) leading us to 93 grams of water. If I had written the recipe specifying the grams of water needed, the reader might have done the mistake of adding 95 grams of water instead of 93, therefore lowering the percentage of the preservative in the whole formulation, and this wouldn’t make the preservative work at its best! whenever you read one of these recipe, just understand that the amount of water is for you to calculate at the end. Thank you for your posts and sharing. I still have to learn a lot about making creams… As you said, water is a problem for preserving them. To avoid these problems with the water, what do you think about making a cream only with oils, butters and waxes and a tonic to use previous to the face cream with the soluble components? Thanks!!! I have tried grapefruit extract as a preservative (hydroalcoholic extract), but I think that it was not very effective. No it is not a preservative whatever resellers may write on their websites. You could try phenoxyethanol, ethylhexylglycerine. Glad to read that you don’t use Vit E or grapefruit as a preservative. Even my supplier states both as preservatives. No sign of the word antioxidant only preservative. I would change supplier: if they sell stuff they don’t even know about, that means they are not knowledgeable in what they do. I’m appreciated your articles from your website. They really help me a lot! 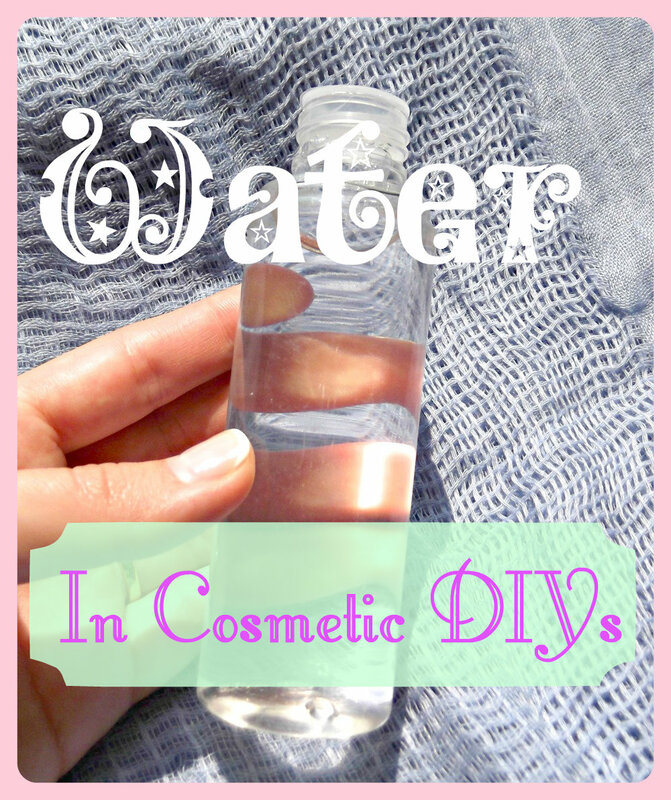 And I’d like to know, if it’s okay to use the filtered water (I have a filtering machines at home, which has a faucet that can filters the water and I can drink directly) for my homemade cosmetic products? Depends how filtered it is. There should be zero minerals inside! Thanks for this post. What if I wanted to make 16 ounces of product? How would I calculate this? Is boiling demineralized water in a metal pot safe? I mean – can it interact somehow during boiling? I don’t know what type of pots people usually use in other countries, but it’s just a standard stainless pot 😛 It’s quite old with scratches (it’s not rusty) on the bottom. I read that boiling in glass, which is placed in the pot with water isn’t actually boiling, because temperature of glass is to low to make water in glass evaporate. I read a topic where specialist, which deals with water 20+ years, wrote that boiling water in a pot made of aluminium/stainless steel might make the water dissolve a few parts per million of the metal. These are very small amounts for me, it’s like homeopathy 😀 – so boiling in the metal pot shouldn’t be a big problem, IMO. You mean a double boiler and yes there it cannot actually boil. I meant an ACTUAL GLASS POT, not double boiler.